Break away from the usual sightseeing and beach-going activities when you choose this exciting anthropological excursion packed with culture, education, and nature…..
You’ll find out lots about Grenada, the Spice Isle, on this tour. There are lots of traditions and rituals still practised today that come from Grenada’s West African influences as well as those inherited from South American Indians and European settlers. Close to the Sendall Tunnel we will visit the Grenada National Museum where Amerindian artefacts are displayed. The building itself is a historic site, being the jail in the 1700’s! Following this educational introduction, we’ll drive close to the National Stadium to see the sharpening stone before continuing along the west coast to see the petroglyphs at Duquense and Victoria, and then on to Mt. Ritch to view the stones there. Our next stop will be at the chocolate shop at Belmont Estate driving on to Pearls which was once a large Amerindian village, as are most airports in the Caribbean! We return to St George’s via the lush Grand Etang rainforest. 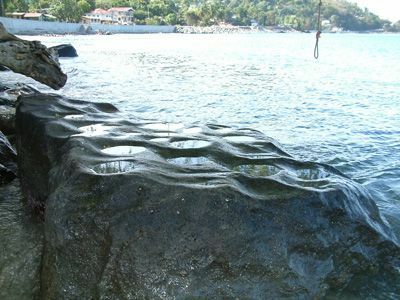 We’ll visit nearly all the rock art sites on Grenada, such as Mt. Ritch, Victoria, Duquense Bay, Grand Etang Forest Reserve, Queen’s Park, and St. George’s, all of which are situated in beautiful natural areas all around the island. This tour offers art in nature, Rock art is a fascinating form of artistic expression that started thousands of years ago. Humans engraved, etched, painted, pecked, or otherwise physically changed the faces of the walls in caves and on rocks. As you view the art with your guide, don’t be surprised if his commentary helps you to evoke images of the rituals that took place at such sites! As we take this scenic drive with the windows rolled down (if you choose) and the cool ocean breeze on your face, local people in the small towns we pass will offer you traditional foods like coconuts and grilled goodies. Your guide will assist you in declining and/or purchasing, if you desire. You might also be interested in our Archaeological Field Trip, click here to read more about it!